We have a strong tradition of Careers Education, starting in Year 7 and continuing throughout the school and beyond. The Careers Department is open to all students, and staff offer informal “Drop In” sessions at lunchtime. Careers Evening – this is the flagship event for the Careers Department. Over 60 delegates, many of whom are ex-pupils or current parents, offer advice on a broad range of career paths. Recent speakers have included architects, barristers, civil servants, investment bankers, economists, solicitors, fund managers, GPs, a Fetal Consultant, TV producers, engineers, advertising and marketing managers, scientists, and representatives from fashion and retail industries. Last year many blue chip companies including JPMorgan, Net-a-Porter, Unilever, AMV BBDO, Hartswood Films, IBM, Deloitte, Sky, HM Treasury and Comic Relief attended. Higher Education Fair – each year representatives from the top 30 UK universities visit LEH to talk informally to students about higher education options and offer advice on making a good application. The delegates are well informed and the girls enjoy researching the different institutions. The HE Fair aims to encourage students to prepare for university Open Days in the summer term. Additional Talks – the Careers Department offers a programme of lunchtime talks on a range of topics such as, an Introduction to Investment Banking by a Director of Morgan Stanley, Sponsored Degree programmes and talks on women in Engineering and Preparing to Apply to Medical School. These talks provide the opportunity for girls to listen to speakers in small groups and to ask them questions. American Universities - We hold annual talks about the application process for American Universities, including advice on sports scholarships, financial aid and academic scholarships. We also collaborate with Hampton School to provide preparation courses for the ACT admissions tests. In addition to this our alumnae who are currently studying the USA return to answer questions for those considering American Universities. Specialist Careers Event – this annual event provides an in depth view of career paths of alumnae following a particular degree. The most recent event was a joint venture with the Music and Drama Departments for careers in the Creative Arts. This included an opera singer, multiple actors, casting directors and producers. The Sixth Form Careers Programme covers a wide variety of topics which aim to prepare the girls not only for their Sixth Form studies but for both university and their intended careers. Parents, old girls and other friends of the school offer help through giving Careers talks, and participating in our annual Careers evening, run jointly with Hampton School for Boys. We have a very strong track record in preparing pupils for the best universites in the UK and abroad.....click here for Destination of Leavers information. BP runs an excellent programme for link schools, which provides access to the highly-regarded BP work experience programme; additionally executives visit the school on a regular basis to talk to students. Morgan Stanley - some Sixth Formers have attended Insight Days at Morgan Stanley, the investment bank, and have then been selected as ambassadors for the bank. They encourage other students to attend talks by Senior Management from Morgan Stanley in school, and help to publicise internships. Deloitte, the global consultancy and accounting firm, offers a prestigious gap year programme. A number of recent leavers have been selected to be Deloitte Scholars and the school encourages Sixth Formers to apply. Ernst & Young offers a university bursary scheme for students interested in working in consultancy and accountancy. Some recent leavers are being supported through this programme. 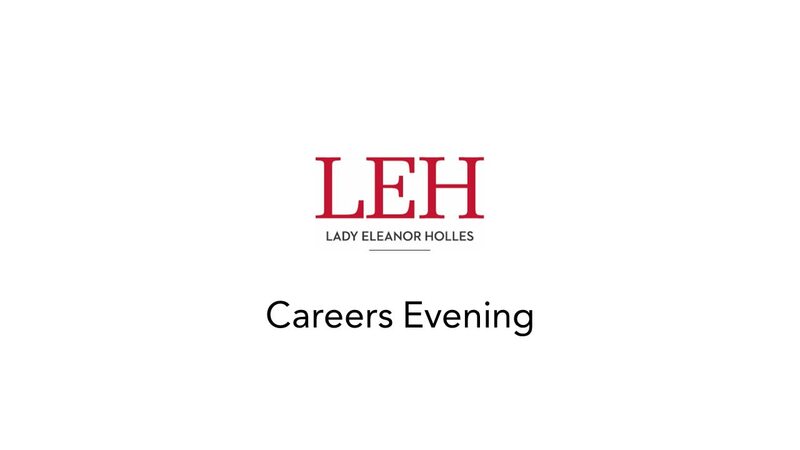 Alumnae -LEH has strong links with alumnae in a wide range of career fields who help by mentoring students, returning to talk to pupils at the annual Careers Evening and sometimes offering work experience. Introduction to Work Experience: From the Upper Fifth onwards, all girls are encouraged to arrange work experience and they take part in some superb professional placements. A number of students apply for formal programmes, with well-known companies such as BP, McKinsey, PwC, Goldman Sachs and the National Physical Laboratory, as well as Insight Days run by investment banks, consultancy firms, and museums. Entry to these programmes can be competitive, but students are supported through the application process by the LEH Work Experience Co-ordinator. Other students found placements within a very wide range of careers such as the Arts, Marketing, the Law, the Digital Sector, Science and Finance.